The play "Honchô Nijûshikô" was originally written for the puppet theater (Bunraku) and staged for the first time in the 1st lunar month of 1766 in Ôsaka at the Takemotoza. It was adapted for Kabuki a few months later and was produced by both Nakamura Utaemon I and Mimasu Daigorô I in Ôsaka at the Naka no Shibai [casting]. "Ashikaga Yakata" ("The Ashikaga Mansion" in English) is the common nickname for the two scenes of the 1st act of "Honchô Nijûshikô". 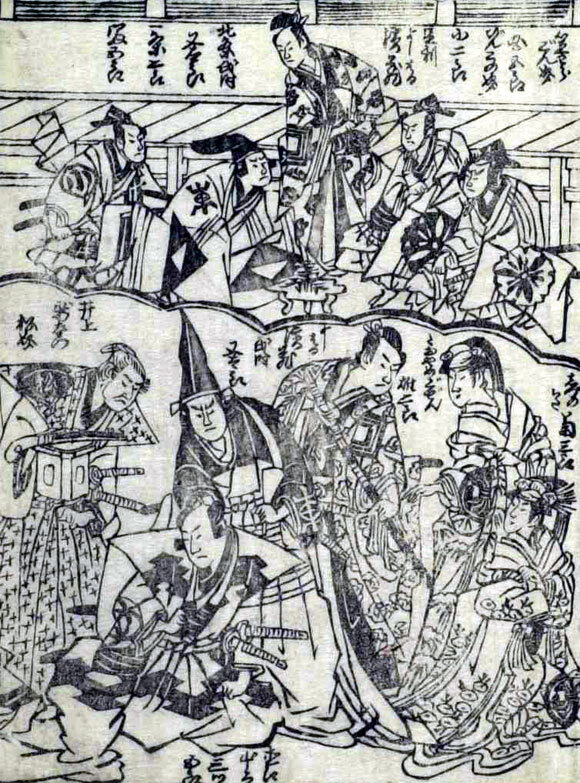 To offer congratulations to the 12th Ashikaga Shôgun Yoshiharu on the conception of his child by his mistress Shizunokata, Hôjô Ujitoki, Nagao Kagekatsu and other feudal lords come to the Ashikaga mansion with their presents to the Shôgun. Ujitoki tells the Shôgun that two prominent feudal lords, Nagao Kenshin and Takeda Harunobu, who are fighting with each other, are both intent on overthrowing the Shôgunate government, taking advantage of the confusion caused by their fighting. Kagekatsu, who is Kenshin's son, explains to the Shôgun that the fighting has resulted from a quarrel over the possession of the sacred helmet of Suwa Hôsshô, which his father has borrowed from Harunobu. At this moment Harunobu arrives. Ujitoki and his retainer Murakami Yoshikiyo again accuse Harunobu and Kenshin of their alleged plot to rebel against the Shôgun. Kagekatsu refutes them, saying that their allegation is utterly groundless. Taoyame, the Shôgun's wife, suggests that Harunobu's son Katsuyori and Kenshin's daughter Yaegaki marry to pave the way for their fathers' reconciliation. The Shôgun agrees to her proposal. In the innermost room of the Ashikaga mansion Naoe Yamashironosuke, Kenshin's retainer, has a secret meeting with what he believes to be his sweetheart Yatsuhashi, a maid servant to the Shôgun, and finds to his surprise that his partner is in fact Shizunokata, the Shôgun's mistress. She says she loves him in spite of his refusal to have anything to do with her. The Shôgun appears with a sword in his hand and tries to kill Shizunokata, accusing her of her immoral love. Taoyame pleads with him to pardon her, for she knows that Shizunokata is merely pretending to be in love with Yamashironosuke. Shizunokata then confesses that she wished to be punished with death for her pretended love because she felt guilty of forestalling Taoyame in conceiving the Shôgun's child. The Shôgun says he will sever his relations with her and advises her to enter the Buddhist priesthood before giving birth to his child. A samurai calling himself Inoue Shinzaemon* visits the Shôgun and presents him with a rifle. When the Shôgun asks him to show how to operate it, he suddenly turns the weapon toward the Shôgun and shoots him to death. He then flees, leaving the rifle behind. Taking advantage of the confusion, a masked giant carries Shizunokata away. Kagekatsu chases after him. Harunobu and Kenshin hurriedly arrive and make an open pledge to Taoyame to apprehend the assassin within three years and if they fail to do so, to kill their respective sons, Katsuyori and Kagekatsu, in token of apology. Harunobu cuts off his hair and changes his name to Shingen, indicating that he will enter the Buddhist priesthood. Yamashironosuke says he will commit suicide to take responsibility for his failure to prevent the abduction of Shizunokata but Kenshin says he need not do so and allows him to go away with his sweetheart Yatsuhashi. Murakami Yoshikiyo, who covets Yatsuhashi, tries to prevent her from going, but Yamashironosuke drives him out and kills Yoshikiyo's retainer Yokota Heinai, who has come to attack him. (*) Inoue Shinzaemon is none other than the villain Saitô Nyûdô Dôsan.